The setting: A loop trail outside Pinecrest, CA, starting at the Burst Rock trailhead at Gianelli cabin and ending at Crabtree. Powell Lake, Chewing Gum Lake, Toe Jam Lake, Wire Lake, Upper Buck Lake, Paiute Lake. Day one – Gail, Denise, and Mary drove from Ashland to Pinecrest, on the west side of the Sierras, via I5, a 7 1/2 hour drive if you don’t stop. They camped that night at the Pinecrest Campground, a crowded, dry, and not beautiful spot. If we did it over again, we would stay at the Strawberry Inn, which is where we stayed the last night. Alan was already in Pinecrest at Mi Wuk, where he has stayed many years in the past. He noted that the lodge and other facilities at Mi Wuk had closed down, as well as other places in Pinecrest and wonders if that is due to California’s ailing economy. Day two – we began the trip with great enthusiasm, climbing immediately 600’ from the start of the trail. The book said this would be the most difficult part of the whole trip, but I think we felt it was not that difficult and that other parts of the trail were more challenging. We were soon into the landscape that captured our imaginations and senses for the rest of the trip: granite rock forms rising up around us and also lying on the ground in great slabs, often with boulders of granite perched on top; wildflowers in abundance; spacious and flower-filled meadows; open pine forests; and blue skies with white clouds. We had lunch at Powell Lake, where we saw what would be typical of all the lakes – blue water filling basins carved from the granite, small islets in the lake covered with grasses, flowers, and bonsai’d trees, alpine firs, pines, and hemlock surrounding the lake. We continued to Chewing Gum Lake, at 4.7 miles (including .4 miles in and out of Powell Lake), where we camped the night. A breeze that would follow us throughout the week kept the mosquitos at bay. That evening we played some rummy, but for some reason no one requested the game again all week – could it be that one of us never won even one hand? Day three – we had planned to stay at Whiteside Meadow this night, but hikers we met on their way out convinced us that Toe Jam Lake was the place to be. Whiteside Meadow, surrounded by rock formations, was huge and the first of many large fields of lupine and other wildflowers that we would see. In some places the expansive flower fields were literally solid blue with lupine. Denise soon showed her skills as trailfinder, guiding us over large granite slabs, where the trail was easily lost. We appreciated and depended on her all week. Gail, on the other hand, was able to predict how long each section would take us, often to the exact minute – this gal’s got a real head for numbers. Toe Jam Lake, 5.9 miles from Chewing Gum, was surrounded by fields of wildflowers, and since we got to the lake by 1:30, there was plenty of time to identify flowers and to scramble on the rock formations. There were two llamas contentedly sitting in a small meadow amongst the rock, resting up for further packing. (We’ll be exploring the idea of having pack animals take our packs to a lake in the future, backpack from there, and then have the animals return to take our packs out.) Gail and Denise enjoyed washing clothes and hair, while Alan and Mary collected more dirt from day to day. At about 8:30 pm, we heard cowbells. Gail was the only one quick enough to stick her head out of her tent and see a small herd of black cows walk on the trail just below our campsite. Others hikers we had talked to that day said a one-mile cross country hike to Leopold Lake was worth doing, but we decided to save that for another time. 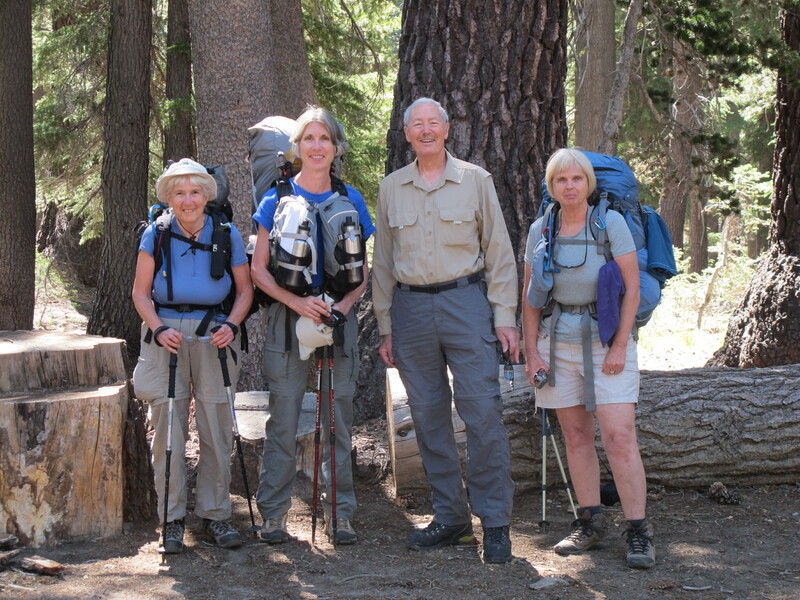 Day 4 – Everyone feeling strong, we continued on to Wire Lake, a hike of 5.3 miles, where we spent two nights. The hike through open pine forests with sunlight filtering through was beautiful and refreshing in the morning. Temperatures were in the 70’s to low 80’s, as it had been all week. Lupines and asters lined the trail. After setting up camp and having lunch, Alan, Denise, and Mary hiked down the drainage to the lower Wire Lakes, both of which were very low on water, due to the lack of snow this last Winter. Alan took pictures of stunted and contorted trees, to prove to his OLLI Japanese gardening class that these shapes actually exist in nature. In the evening, Gail and Denise told us some very entertaining and scary bear experiences. Day 5 – We dayhiked to Upper Buck Lake, which proved to be an eventful day. Tysen had recommended this lake to us as one of the most beautiful, and we all agreed with him. The lake is dotted with islets and is surrounded by a tall and beautiful granite cirque, much higher than at the other lakes we visited. We all felt that someday we’d like to camp at this lake for a couple of nights and then be able to dayhike to Emigrant Lake. After having lunch, Alan, Denise, and Mary decided to walk further around the lake. Large granite outcroppings interrupted the trail here and there, typical for all our hikes so far, forcing one to scout periodically for where the trail continued. On our return, we took the wrong trail, and instead of rounding the end of the lake to where Gail was waiting, we found ourselves going south on the trail to the lower Buck Lakes. It took us quite a while to figure that out that we weren’t even at Upper Buck, and simple as it seems now, quite a while to figure out how to get back. We felt like we were turned around and lost. We finally made it back to Gail, who with good humor told us all her possible plans if we hadn’t made it back. Under her good humor, she had been worried, and so were we! Alan and I had left our daypacks, both filled with survival gear, with Gail. Alan and Denise had compasses, and Denise had a map, but both my map and compass were with my other survival gear. Even what seems like a simple side trip can turn into a dangerous situation, so we learned our lesson about taking all our gear with us. Because of this, I am going to submit to this blog a reminder about The Ten Essentials. The hike in and out of Buck Luck from Wire Lake totaled 8 miles and was very rigorous due to the steep drop to the lake. Between that and getting lost, Alan, Denise, and Mary hiked about 13 miles total, and we were all pretty done in. Day 6 – Thursday! (Remember what Alan said?) We got up to a tiny flurry of snow crystals, which quit almost as soon as it started. We had breakfast and packed up, just before the rain started falling. We hiked the 5.2 miles to Paiute Lake in the rain, and just as we were ready to set up our tents, the rain stopped. So except for ground cloths on wet ground, our tents never got wet. How lucky we were. There were not nearly as many wildflowers on this section of the hike, but tall and commanding ridges stood on our right most of the way. We did lots of resting in camp this afternoon, not being nearly as adventuresome as the previous day. Alan read to us after dinner from his Kindle, a selection from Desert Solitaire by Edward Abbey, that was interesting and educational, and we all enjoyed it a great deal. In fact, I’d like to propose that whoever wishes might bring something to read to the group on future hikes – it was a very entertaining way to spend some of the time between dinner and bed. Day 7 – we hiked out 8 miles to Crabtree, the end of the trail. There were more downs than ups, but the ups were very challenging, the first two being granite staircases and granite slabs and the third a steep set of switchbacks that didn’t want to quit. Before the last ascent, Allen and I crossed a creek (only our third creek crossing in the whole trip), where we met two fellows on horseback, plus a pack horse. The younger man, son of the other, looked very unhappy. Turned out his cinch had broken earlier and he had fallen onto the rocks. I guess he was pretty banged up, so they were trying to get out to take him to the doctor. They had bows and arrows on the pack horse, along with a bulky pack hanging over the sides of the horse, covered by a tarp. I had to wonder if they’d been hunting. The last two miles were easy but boring, and we met numerous parties coming up, dayhiking or planning to camp for a night with kids. We all were like horses to water, smelling the showers and clean clothes that awaited us, Alan back to Mi Wuk and the women to Strawberry Inn. We met for dinner at the Steam Donkey in Pine Crest, where the food was excellent. Day 8 – Alan remained in the Pinecrest area to visit friends, while Mary, Gail, and Denise drove over the Sonora Pass, which none of us had seen. At over 9000 feet at the top, the pass is rugged and beautiful. Then onto 395, 44, 89, and I5 home, passing both Lassen and Mt Shasta. With stops for lunch, snacks, and stretch breaks, a long day in the car. Tired but happy, we spent some of our time talking about what our next hike in the Sierras might be. Thank you to Alan and Tysen for suggesting this particular Sierra hike and helping to plan the route. Thanks to Alan for suggesting the time, knowing from his previous experience the best time for good weather and good flowers. Thanks to everyone in the group for being congenial, helpful, and good-humored at all times – it seems we made a pretty good team!